Since he made his first appearance in the comic book issue: Amazing Fantasy #15, in 1962, Spiderman is still one of the most beloved superheroes to children today. Peter Parker has been around for over 50 years now with almost everyone knowing his story. Everyone knows that he was an ordinary high school teenage boy until he got accidentally bitten from a radioactive spider. By being bit by this radioactive spider, Peter Parker became known as Spiderman. Spiderman is wonderful to introduce young children too – especially – preteen or teenage boys as he’ll eventually become a relatable character to them. He was often shown struggling with his own feelings of being rejected, loneliness, and trying to find his place in this world which many teenagers understand and can relate too. Your Spidey Sense can take a rest--there's no danger of choosing the wrong Spiderman comic if you're browsing our top ten, now presented in our brand new buying guide format! For this update we made sure that all of our top ten products were still the highest rated and currently available in today’s market. We also added more information to our criteria section. For any other questions that you might have, please check out our FAQ. 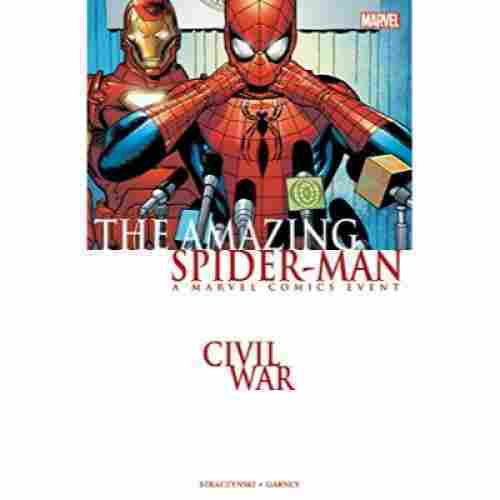 This graphic novel comic book is not your typical Spider-Man book as the plot covers a Civil War dividing Marvel superheroes, including Iron Man, Captain America, and the Fantastic Four. It contains awesome, colorful illustrations and an exciting storyline. The book comes in a 168-page paperback edition or on Kindle and comiXology. We recommend this one for kids 11 years and older as it’s not a children’s book but an actual comic book. This comic book is excellent for your child to enjoy reading while expanding their vocabulary. Graphic novels like this are not written for a certain age range, and so the vocabulary is usually more complex than a book targeting a younger audience. Your child will discover the meaning of new words by asking an adult, inferring by looking at the illustrations, using a dictionary, or looking it up online. Having a large vocabulary is beneficial in life as it assists in being able to clearly communicate with others, choosing words that accurately express what someone is aiming to express or convey. This comic book contains notably beautiful illustrations that will help to inform your kid of the plot. It’s almost like watching a movie with the amazing comic artwork, and still builds important reading skills with the text blurbs. Additionally, building vocabulary helps kids expand their perspective to understand the world with a wider lens. For example, a child may learn a new word by reading this comic book that introduces them to a new concept previously unknown to them. This opens up their minds to the vast knowledge that lies beyond what they experience in their own lives. A large vocabulary is ultimately a tool for success, whether it be in school testing or in your kid’s future professional life. Studies have found correlations between people in positions such as managers, presidents and vice presidents, and superintendents and having an extensive vocabulary. This is the first-ever Amazing Spider-Man comic, originally published in 1962. It may be nearly six decades old, but it contains a timeless story that introduces Spider-Man to the world. 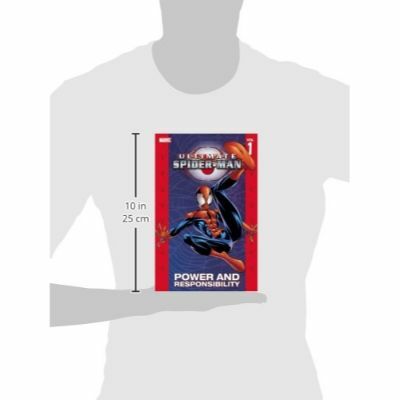 This book is essential for any Spider-Man fan. It is a new print version of the comic, complete with the original illustrations and story. Because this book describes the story of teenager Peter Parker becoming Spider-Man, it is actually very relevant for your pre-teen or teenager as they move through the range of struggles and emotions associated with maturing, building self-image, and moving on from childhood to adolescence. This book is totally geek-out worthy for any Spider-Man fan, or is the absolute best introduction to a kid new to the massive world of Spider-Man literature. It is the first-ever Spider-Man comic, after all! The origin-story plot lays the foundation for the mega-franchise Spider-Man would eventually become. It explains Peter Parker’s transformation into Spider-Man and introduces many other key characters such as Dr. Octopus, J. Jonah Jameson, the Daily Bugle, Electro, and the Sandman. This rendition is a hardcover copy with 272 pages, and also has the option of Kindle and comiXology versions. 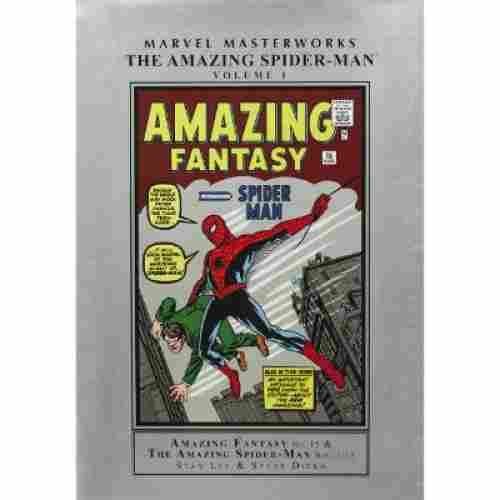 It contains both the Amazing Fantasy volume 15 and The Amazing Spider-Man volumes 1-10. Marvel suggests this comic book for children 12 years old and up. This book is perfect for any Spider-Man fan or as an introduction to the iconic superhero. 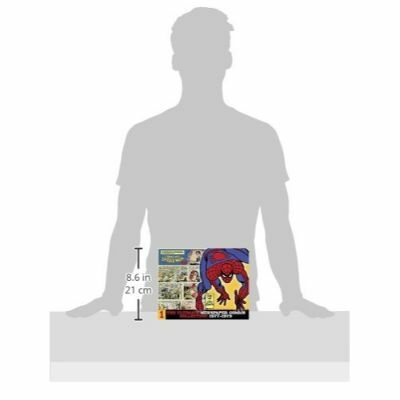 Your child will undoubtedly be captivated by the exciting stories covering the pages of this massive comic book. Peter Parker has a tough time with his transition to Spider-Man. Even once he begins to accept his fate as a superhero, he is not seemingly undefeatable like so many other superheroes are depicted. He faces difficulties both as a superhero and in his personal life. Your child will learn some important life lessons while reading this historical comic book, such as the infamous notion, “With great power comes great responsibility,” the importance of persevering amidst struggle, and the notion that every life matters and is worth saving. Everyone’s favorite web-slinging superhero is at it again in This Is Spider-Man, A Level 1 Reader. 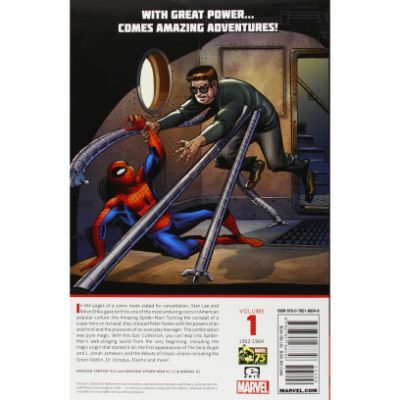 Designed specifically for beginning readers, this 30-page comic-style storybook showcases a day in the life of Peter Parker, AKA Spider-Man. Each page incorporates beautiful full-color imagery in a cartoon style that is sure to appeal to your child, with simplistic words and phrases. These short sentences and repeating words are the perfect way to help your budding reader learn new sight words and begin to tell YOU the story! Follow along as your child meets Peter Parker and watches him to turn into Spider-Man for the first time. The story reads in just a few minutes as well making it ideal for short storytimes before bed or while waiting at the doctor’s office. Bringing your little one’s favorite superhero to life can make any story time better and since this book is designed to help your child learn how to read, you can easily integrate a lesson on sight words into your reading routine! This book has been created with young children in mind, focusing on telling the well-known origin story of the red and blue-clad superhero using short and simple phrases. Repetitive word usage and sight words combine to create an informative but easy-to-read story perfect for preschoolers. Level 1 Reader books are great for building your child’s reading confidence and expanding their vocabulary skills. Bring the adventures of Spider-Man home to your littlest Avenger with Marvel: The Amazing Spider-Man. 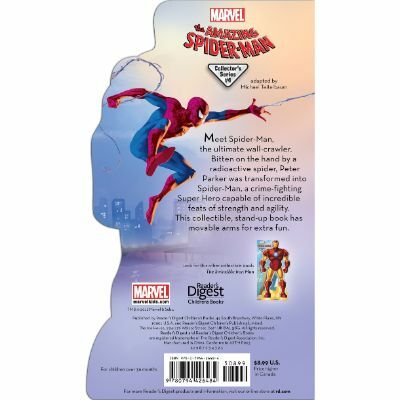 This figure-shaped book is part reading adventure and part toy as it is designed to look just the like red and blue-clad web-slinger. The arms of the book can be moved and posed, allowing your little one to act out their favorite action moments. The book is also designed to stand alone and makes a perfect display piece. Interactive books such as this one that provide your child with a way to play outside of reading are ideal for encouraging your little one to emulate and recreate. This can stir their imagination and spark their creativity, driving them with a need to learn more about this enticing figure. This can then translate into a desire to read which is cognitively beneficial for their entire life. It also presents an opportunity to discuss death in a way that is appropriate for preschool to kindergarten age. This book encourages your little one to read and play with a durable format that can be posed into a number of different superhero action moves using the adjustable arms! 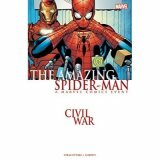 Featuring the original story that depicts how Peter Parker first gained his amazing abilities, it breaks the complex history into bite-sized chunks perfect for early readers. One word of caution, this book does include references to one of the most iconic moments that defined Spider-Man’s beginnings, the death of his Uncle Ben. We strongly recommend reading this book before presenting it to your child to make sure that it is suitable. 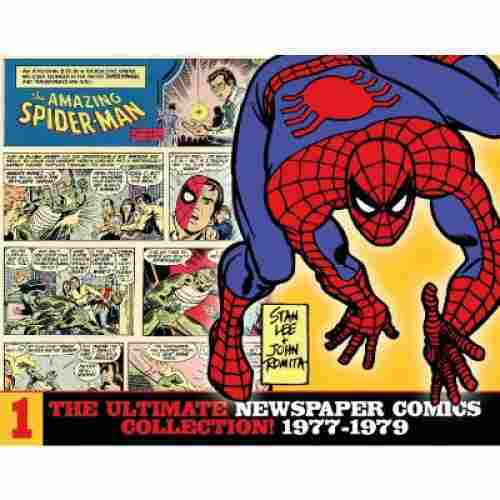 One of the longest-running comic newspaper strips is the amazing story of Spiderman. This series was authored by Stan Lee and along the way authors like John Romita and others contributed to the series. Studies find when earlier readers are struggling with the concept often when they are given a subject that they can find an interest in they most often become more confident readers. Classic Spiderman comic is a great way to grab their attention and never let it go. Introducing the love for reading and action-packed comic strips in one place with this classic colored comic series collection. This is the deluxe book of all the strips collected from the daily and Sunday newspapers from January of 1977 through the end of 1978. It even includes the rarely ever seen logos that were placed on the top tier. Each of the comic strips in the book is featured just as the appeared in the newspaper. 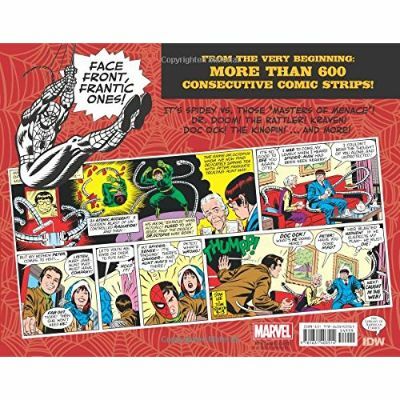 This deluxe series book even includes all the comics in color! What a wonderful book to add to your collection. Full color and in their original state. It is awesome to be able to look at the story of time through comic strips. They show so much history and what a fun way to connect with a young reader. With the current box office smashing success of the Marvel Cinematic Universe, Spider-Man is well-known today as the young, wise-cracking kid superhero under the wing of Tony Stark. Despite his modern loveable sidekick-like status, Spider-Man actually preceded Iron Man in the comic world by an entire year, appearing in the Amazing Fantasy in 1962. This book is the ultimate collector’s dream. It included both black and white scans as well as full-color reprints of the original Spider-Man comics dating from 1962 to 1964. Spider-Man is a perfect hero for preteen to teenagers as Peter Parker is a reluctant teenager himself. The original comics showcase many character-developing moments where the eventual Avenger struggles with going to high school, making friends, and being an awkward outsider trying to fit in. This can help your child empathize with the character and may help them to process or talk about issues in their own lives as well. 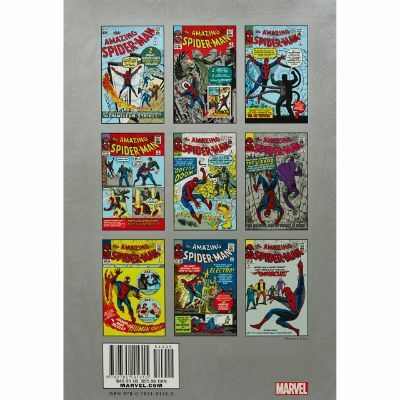 This fantastic collection would make a great gift for any Spider-Man fan, young or old, to step away from the flashy cinematics of the current Marvel Universe and look back on the superhero’s humble beginnings. The physical edition of the book is a hardcover with a padded cover. Younger children will love listening to the stories. Children between 6 and 8 will be able to enjoy reading the 5-minute stories themselves. This is a perfect book for reading before bed, in a waiting room, or really any time without leaving your kids hanging in the middle of a story. 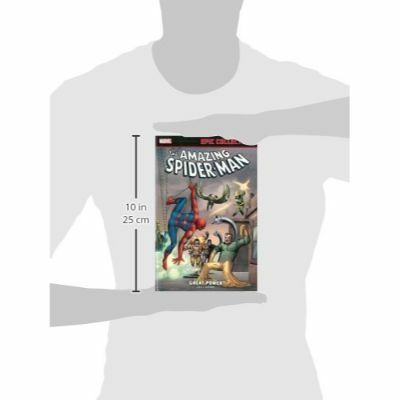 This is an awesome format for a Spider-Man children’s book. We love how the stories are short enough to complete in a timely manner rather than carrying over one story for multiple reading sessions. This book contains twelve Spider-Man stories that can be read aloud in about 5 minutes. The Kindle edition includes only four of these 5-minute stories. 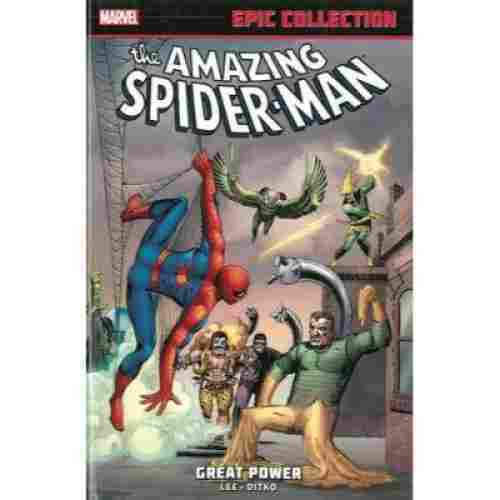 Each story is complete with colorful illustrations that display the various plots of Spider-Man taking on the infamous villains Doctor Octopus, Green Goblin, and more. 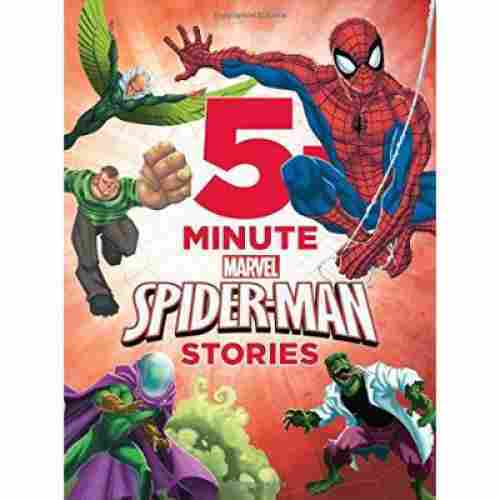 This collection of 5-minute Spider-Man stories is a great book for younger kids as it helps to enhance their imaginations. Using imagination involves a person being able to visualize something in the mind that they have not experienced before, as well as creating completely new ideas and pictures in the mind. Spider-Man is a superhero with spider powers who takes on villains and is the product of Stan Lee’s imagination. When children gain access to imaginative creations such as the stories and illustrations in the book, they begin to understand the truly infinite nature of what they can imagine themselves. By tapping into and using their imaginations, young children develop cognitively and socially, leading to success in school and other endeavors. It is a great suspense thriller that will have your younger reader coming back for more! Comic strips that feature superheroes, like Spiderman are a great way to show disciplines to a young reader. These stories feature right and wrong along with showing how one person can make a difference when they stand up for another person or help them. It is a great way to develop strong personal character development skills. Love being able to pick up a book and know that reading it will not only be enjoyable but will teach my kids a lesson. This book is just that. It is a great way to learn about helping others and treating each other with respect. 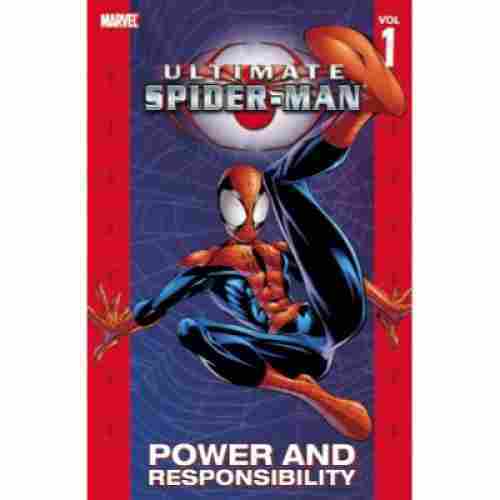 The teenage boy turned superhero through a radioactive spider bite discovers his responsibilities throughout this book. When his uncle has murdered the reality of the matter comes crashing down on Peter’s thoughts. This is where it brings him to use his special abilities to fight off the bad guys and crime wherever in the city. 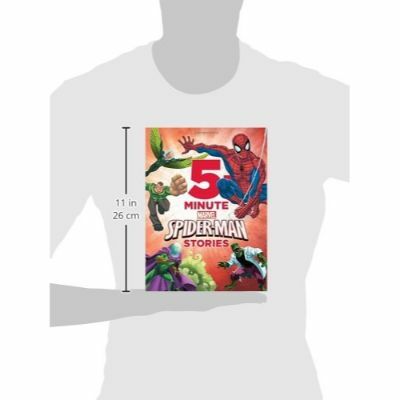 This little book is perfect for young children to enjoy an age-appropriate Spider-Man story. The plot is simple and easy to follow, telling the story of how Peter Parker got his spider powers and how he decided to use them to save people from evil. The illustrations are colorful and captivating, covering all 24 pages. It comes in either a hardcover or Kindle edition. 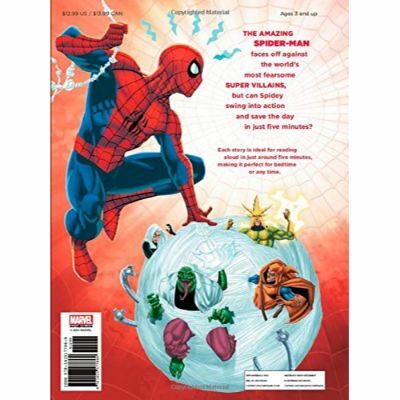 Your little one will love listening to or reading this beginner’s Spider-Man book. It is age-appropriate and engaging. Your child will not be exposed to any graphic violence or scary content, but rather will be fascinated by an easy-to-follow plot introducing them to the beloved superhero’s adventures. The colorful illustrations in this one are awesome and will keep your child hooked from the first to the last page. It is important for children’s books such as this one to be engaging as it helps them associate reading as an enjoyable, fun activity and encourages them to continue reading. Comics are typically too advanced for kids between 2 and 5 years, but so many young children love Spider-Man. It’s great to find a rather rare age-appropriate book for this age range that still gives them a look at some of the superhero’s stories. Rediscover all the classic stories with this series. It gives you a pure taste of the history and lets you rediscover who the epic superhero is. Plus what makes him and the other comic book characters of this time period so popular. Love being able to share some of the epic comic book stories from my childhood with my kids. The book is a composed version of all the volume 2 comics and introduces some of the other characters as well. Super fun and great to have them all in one place to admire. With one of the greatest comic book authors of all time, Stan Lee does it again in this second series comic book. The book is composed of all the stories from the late 1980s. It is a nail-biting story that features, Peter Parker, the college student who was bitten by a radioactive spider and turns into the superhero of all superheroes. Reading comic books is a great family bonding experience. These rediscovered comic book series that have been placed all in one book gives a great way for parents to share with their kids the adventures of Spiderman that they were reading when they were a kid. Family bonding time is beneficial to a child’s mental and emotional development. Whether it’s a children’s book, novel, or yes, even a comic book, reading helps children build their vocabularies. Having a large vocabulary is important for communication, education, understanding, and in the professional world. As children begin to learn more words (and their meanings), they then have a more diverse set of tools to express themselves. A large vocabulary means that a kid can select words while communicating that clearly convey what they are trying to say. As much of the world’s educational systems are built on standardized testing, the bigger a child’s vocabulary, the more likely they will be able to understand test material and succeed in school. Children with wide vocabularies would obviously benefit when testing for reading comprehension or writing. But the potential assisting power of vocabulary extends to other testing subjects, as well as in the instructions themselves. Additionally, having a large vocabulary can help kids understand the world better. Learning a new word and its definition can open up a whole new set of ideas that inform a child about some concept they didn’t know existed. Finally, a large vocabulary can promote success in many professions. Studies have shown that people in higher positions such as managers, superintendents, or presidents and vice presidents score higher on vocabulary tests than people in inferior positions. We wanted to make sure that we had a wide selection that you could choose from on our top ten list above. We made sure that we had not just comic books, but novels, children books, and even “learn to read” books as well on our list all having to do with Spiderman. 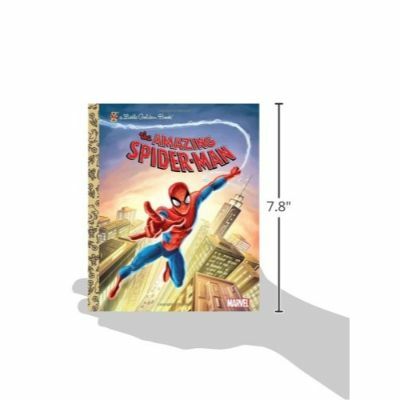 By having a wide selection like this we were able to look for different types of books on Spiderman while considering every age, skill level, and of course, interest. 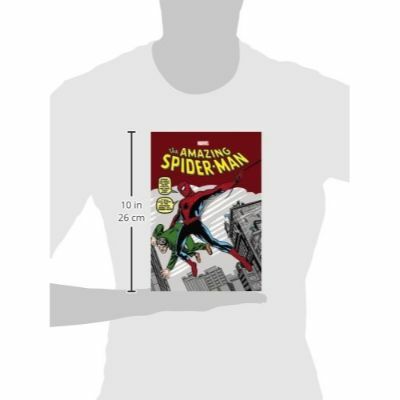 We know that sometimes it can be difficult for parents to find Spiderman or any superhero book for that matter that are appropriate for younger children, considering that he Is a superhero who saves anyone from danger and takes on various villains. We know that with plots such as these they can often become quite violent and sometimes can be way too advanced for the younger crowd. Thankfully, we were able to find some children’s books and even some “learn how to read” books for the little ones who can still enjoy all of Spiderman’s adventures. Spider-Man is an incredibly inspirational superhero who has become one of the most beloved comic book characters of all time. For one, Peter Parker becomes Spider-Man when he is only a teenager. He’s already dealing with typical teenage issues and doing well in school. On top of that, he gets spider powers after being bitten by a radioactive spider and decides to use them to defeat evil and save people in danger. Peter Parker/Spider-Man is not at all-invincible. He can (and sometimes does) get hurt on his missions to save his city from evil villains, and he even risks his own life. He does have powers that make him more capable than your average human, but he is not nearly undefeatable like Superman, for example. Additionally, Spider-Man is a hero with solid and honorable morals that he always sticks to. He never kills, not even the evil villains. For these reasons and more, Spider-Man himself is an inspirational character and worthy role model for children. We specifically selected stories that touch on themes that instill important values. For example, the books on our list teach life lessons such as the importance of perseverance, helping others, spreading good in the world, standing up for what we believe in, valuing family, and that all lives matter. Spider-Man is an awesome superhero and absolutely a “good guy,” but superhero/villain stories can sometimes contain way too much action without much substance. Thankfully we made sure that the stories we included are still exciting, but also go deeper with the values they present. Books are an incredible resource for children to develop literacy and writing skills that they will benefit from and use throughout their lives. Whatever the genre or type of book it may be, every book on this list can help kids excel by reading it. Reading provides countless benefits for children and adults alike. Some of these benefits include the following. When Spiderman first was introduced in 1962, he was additionally only supposed to be a side kick character. We know that because this hero has been around for nearly over 50 years that there’s going to be an overwhelming mass of products in today’s market. 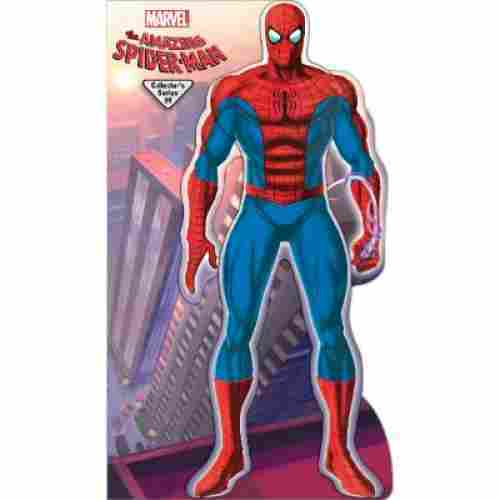 We wanted to help save parents time by doing the research for you and finding the best of the best Spiderman products that the industry has to offer for 2019. We know that while of course from the big screens, to playsets, your favorite action hero there’s bound to be somethings about him that might change over time to make him a little bit more relevant and relatable for some children. One thing however that hasn’t changed is that comic books are still today a favorite way for a child to read. We can’t stress enough how important it is to encourage your child to read, especially with all those different kinds of screens around. It’s time to put the screens away and have your child use their imagination and get lost in the world of reading with some of their favorite characters. Reading is extremely educational and beneficial to your child’s cognitive growth. Not only does it also encourage their creativity, but reading also will help improve your child’s concentration, vocabulary and language skills. It will even help your child gain a sense of empathy as well. We can’t stress enough how important reading is. With comics becoming more and more common in even today’s environment, socializing is a wonderful way of getting your child to talk about what their favorite hero is up to in their latest adventure. When parents encourage and teach their little one to read with a topic that’s interesting to their child, the outcome of your child loving to read will have a better outcome. We are sure that you and your little one will find one of our top ten Spiderman comics and other books perfect for your next story time. We tasked our research time an made sure that each content was age and developmentally appropriate specifically to children. Of course, these books can be loved by all, our main focus was making sure that it was appropriate for children. We also paid specifically close attention to the content that each book contains making sure that with each of our selection there was no graphic violence or other advance material that might not be suitable for younger viewers. Children have a lot going on in their developing brains and minds. They are experiencing so many things for the first time and taking in massive amounts of information at extremely high rates. Kids today are bombarded with even more stimulation than ever before in history, with televisions, computers, and hand-held screen devices, as well as flashy billboard advertisements and neon signs pulling our attention in different directions all over the places we live. It’s no wonder kids (and adults!) are having more difficulty than ever staying focused. Reading is a wonderful tool for increasing focus and concentration and expanding attention-spans. Reading isn’t a task that can be multi-tasked as the reader must continuously view the words. When children sit and read, often times they can zone into the story and not even realize the passage of time. They remain focused and immersed in the story, and their attention-span grows the more often and the longer they read. The ability to concentrate, as well as having a long attention span, are both key elements to success in school, in achieving goals, mastering skills, and in many professional settings. This demonstrates just some of the potential positives reading brings to kids. Visual literacy is the ability to extract meaning from information presented visually and through text, by processing the image and words simultaneously. This form of literacy was not very relevant or useful in the past, however, it is actually very beneficial in the world we live in today. Information today is presented through a combination of text and visual inputs, and will potentially become even more prevalent than information presented through text alone. We can see this visual presentation of information from textbooks and other educational material, on social media, advertisements, infographics, and even signs in public places. The ability to understand such visual information is becoming increasingly important. Visual literacy is not currently taught in schools, so reading books with illustrations such as comic books and children’s books can facilitate teaching the skill for kids. q: Are comic books bad for my child to read? Comic books are actually good for kids to read. As long as the content doesn’t contain anything you as a parent would consider inappropriate, the comic-book format is a wonderful resource for kids to develop and improve a range of reading skills. q: My kid prefers reading on a Kindle, do these books have Kindle versions available? Not all of the books on our list have a Kindle option, but some of the books are available on Kindle. q: Are all the books on this list Spider-Man comic books? Nope! There are quite a few comics on our list, but we also made sure to include a novel, a few children’s books, and even a couple books targeting young kids just learning to read. q: Are the villains in the books going to scare my child? Not necessarily. Villains and scenes with evil ideas and actions can be scary for some kids, but we tried to select books that weren’t too over the top in terms of violence or scariness. Ultimately, you know your child best. If you read each book’s plot summary, you should be able to get a feel for whether it’s going to be an issue for your child or not. It’s always good to remind a nervous child that these books are completely made up. q: Will my daughter like these books or are they just good for boys? We think girls can enjoy Spider-Man books just as much as boys do, or even in some cases, more! Some girls love action and intense hero/villain plots. 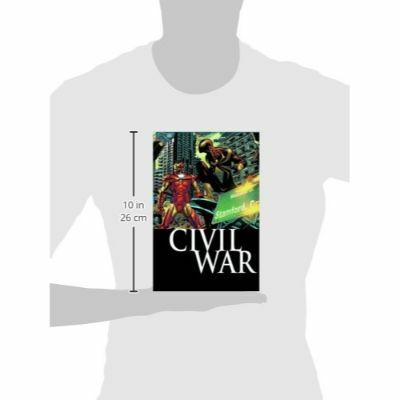 Even if your daughter isn’t that into action-packed stories, many of the books on this list cover a range of topics such as Peter Parker’s personal life, romance, school, and family. We highly suggest giving one of these books a try for your daughter and seeing how she responds. q: If my child is a reluctant reader, will these books help them get more interested in reading? It honestly depends on if your child enjoys Spider-Man. 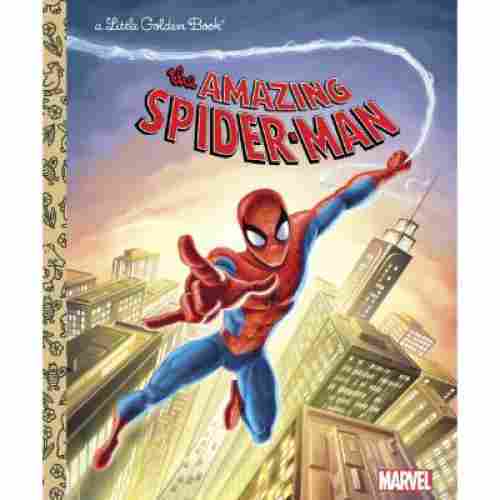 If your reluctant reader is excited by Spider-Man toys, movies, and games, we think these books will have a good chance at enticing them to read, and hopefully, enjoy reading!